At first being influenced by various acts such as ROOT, DEATH SS, CANDLEMASS and MORTUARY DRAPE, the band now moved further into exploration of cryptic realms. Latest EP Horrific Transcosmic Overture marks a whole new chapter in band's opus and introduce some new elements in their own blend of black/occult metal - which this time came from more bestial and uncontrolled spheres of the esoteric abyss. Originally, the EP was released last year by the band - in DIY tape format with xeroxed covers. 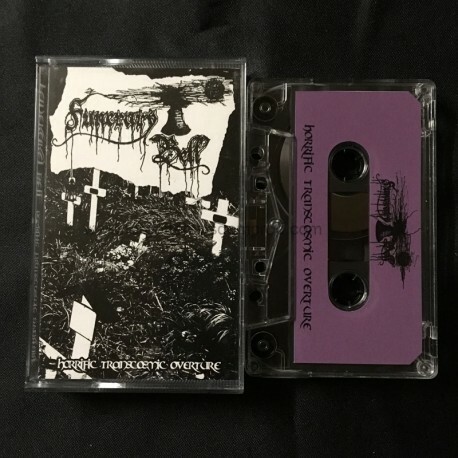 This release here is on pro tape and with pro cover and includes the EP (on A-side) and previously unreleased recordings from their first live ritual - Live At Tombstone (on B-side).